We are thrilled to share our February 2018 Job of the Month and couldn’t be more excited about this painting project to kick off our new monthly blog series! 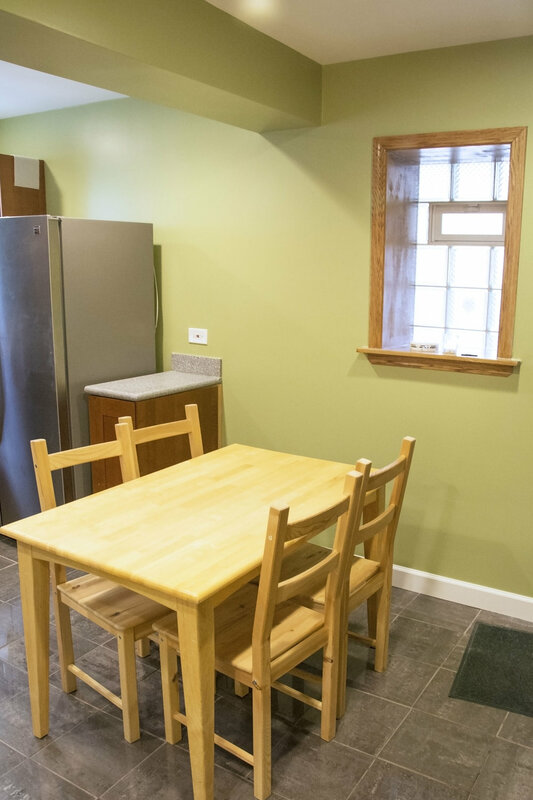 When it came to selecting the job of the month for February, there was no question in our minds that this exhilarating and refreshing color update in a Chicago Logan Square garden apartment would be the winner. Embracing bold color, our Client wanted to animate the wall colors in her living room, hallway and kitchen. This painting project is a testament to the power of color to make a home come alive, reflecting the homeowner’s singular personality and design sense. We love working on projects like this where beautiful paint colors come together with excellent interior design and our professional painting skills to deliver a dramatic home transformation. 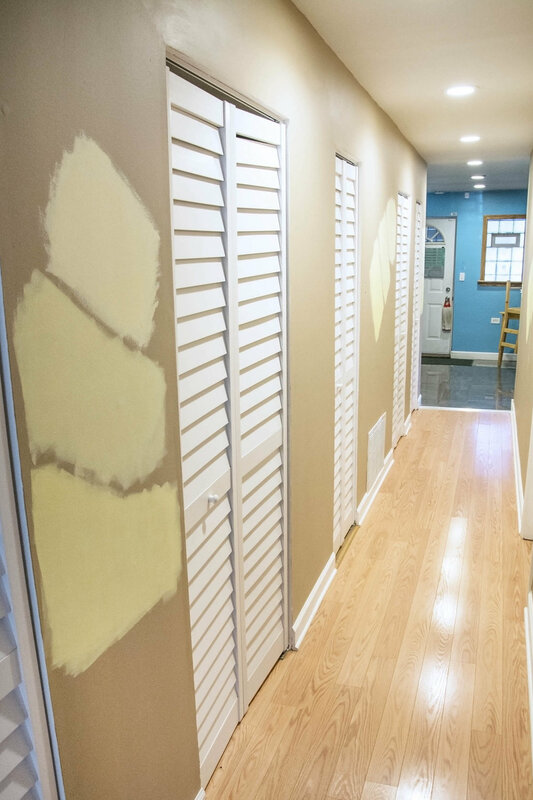 Before applying color to the walls, the Blue Door Paintingcrew takes a number of critical site and wall preparation steps to ensure smooth, high quality finishes and a neat, splatter-free work area. We begin by moving all the furniture to the center of the room and covering the floors and furniture. Beautiful wall color needs a smooth base canvas, so we sand the walls with light sandpaper to remove any surface imperfections and repair all cracks, holes and dents. You can read more about proper wall preparation in our previous blog post. 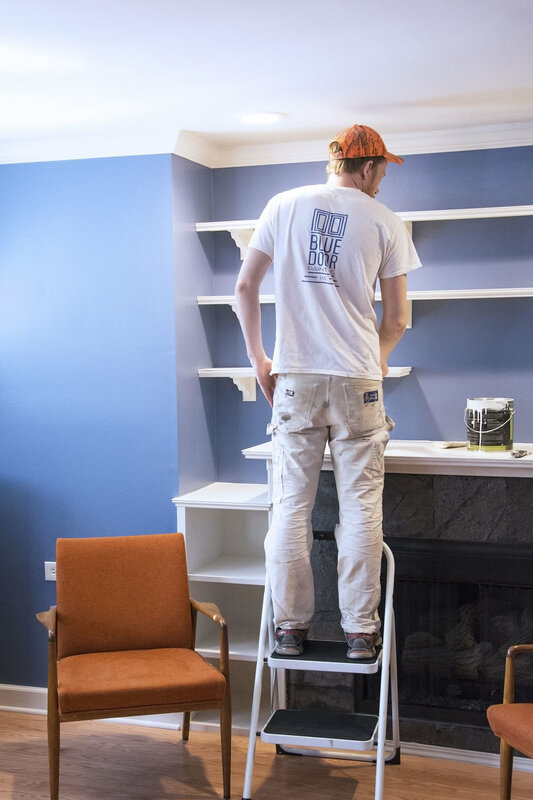 To ensure that the color intensity would come through vibrantly, our crew first primed the walls using primer and then applied two coats of finish paint. 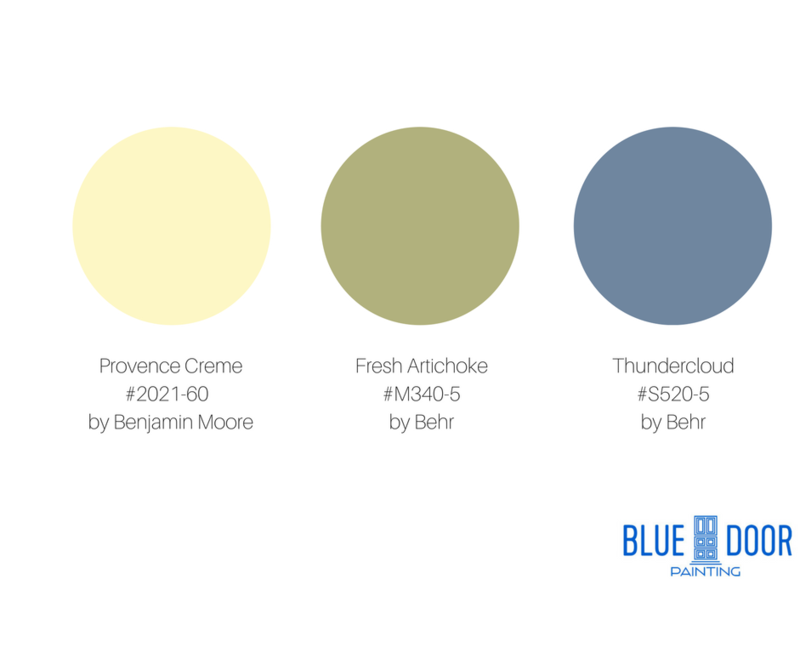 The colors used in this project are: Thundercloud #S520-5 by Behr, Fresh Artichoke #M340-5 by Behr and Provence creme #2021-60 by Benjamin Moore. As you can see from the BEFORE pictures, the living room walls were previously painted in a mild light blue color. Our Client wanted to create a more dramatic color contrast to showcase her gorgeous yellow couch (LOVE IT!) 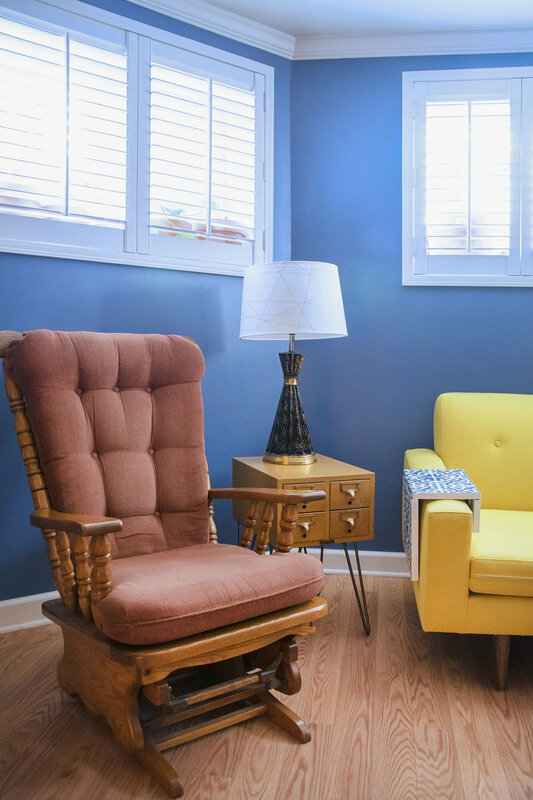 as the room’s centerpiece and chose this stand-out blue paint – Behr Thundercloud #S520-5. We tried to capture her impressive color selection process with the paint color swatches on the wall. (PRO TIP: Getting paint samples and painting sections of your wall with different colors you are considering is a great way to see the color in your space, how it changes in different lighting and the scale gives a much better sense of how the color will feel in your home than just looking at a small paint swatch!) If you are less daring or are unsure what color to paint your walls check out our blog for inspiration or schedule a FREE COLOR CONSULTATION with our Interior Designer, Jasmin Reese. 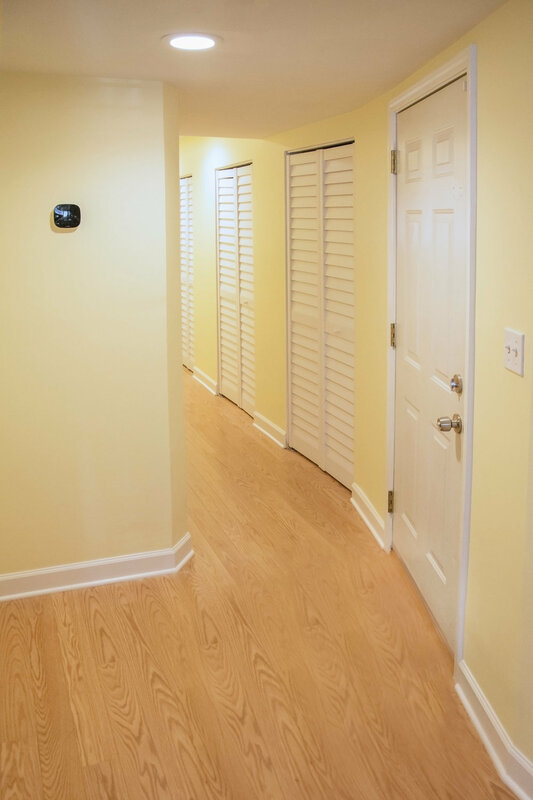 To complement the beautiful new blue walls and yellow sofa, our Client wanted to brighten up the drab beige wall color in the apartment’s main hallway. Here she chose a lovely light yellow paint color called Provence Creme #2021-60 by Benjamin Moore. Notice the uplifting effect of the yellow wall color, making the hallway look bigger and brighter while providing a very pleasing contrast against the blue living room walls. Finally, the last room we painted in this adorable apartment was the vivid blue kitchen. To balance the bold paint colors in the living room and hallway, our Client chose this calming and very grounding shade of green paint called Fresh Artichoke #M340-5 also by Behr. We think this was a wonderful final touch to bring all the colors together in balanced way. We absolutely love this transformation, especially the way this terrific yellow sofa contrasts with the bright and bold blue walls and the unique design elements of this home. It is truly amazing how you can transform your home in just one day! - Yes, we painted all of these walls in just one day! 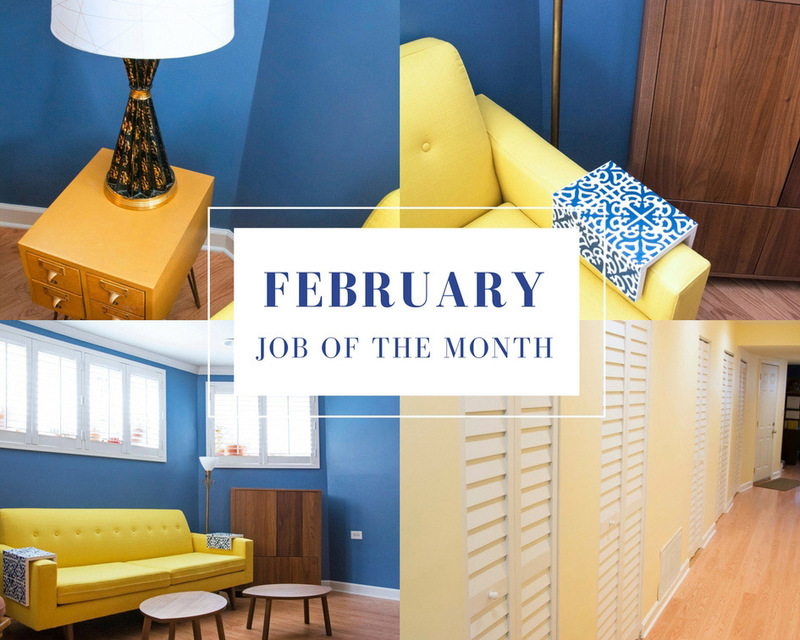 We hope you enjoyed reading this post from Job of the Month Series and gained some inspiration from our customer’s incredible style and willingness to embrace bold color. 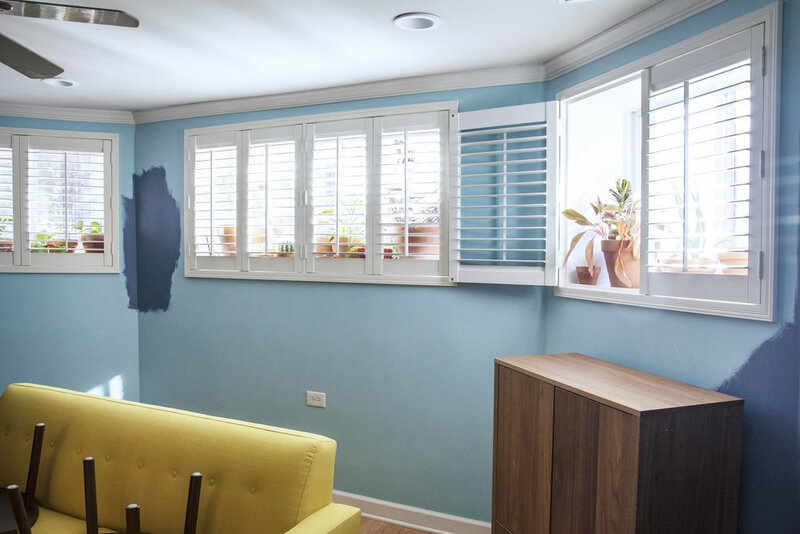 Stay tuned for other interesting Chicago painting projects by Blue Door Painting! CALL US TODAY for a free painting estimate, color consultation and 10% PRE-SPRING painting discount! Follow us on Instagram for daily inspriations and read our 5 STAR reviews on Yelp, Angie's ListorHouzz.